For those who've seen Man on Wire and judged Philippe Petit a solipsist, a monster and an extraordinary, singular human being, To Reach the Clouds is initially quite familiar. 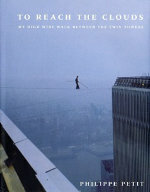 It's the same arrogant and brilliant man, lost in the memory of his great obsession, and there are even phrases and paragraphs from the book's narrative (which details the planning and execution of Philippe's illegal tightwire walk between the World Trade Center's twin towers) which were reproduced exactly in the film. But, then, Philippe also emerges as a more rounded and attractive character – ireful but self-aware, petty but loving, often terrified – and with a piercing artist's intelligence for reading people. The book, more than the film, reveals how many times the project ('the coup') came within a hair's breadth not just of failure but of outright disaster: the writing, supple and quick, has stripped it all down to a racing narrative where one unbelievable event or twist of fate or stroke of outrageous good luck is followed hard by the next. And the wire walk itself, represented in the film with still images, is here encapsulated in a kind of prose poem – highly and strangely wrought, but beautiful too, and protective of the mythology of an event which, however it might be documented, must always be unrepeatable.